While Thompson, at 5-foot-10, holds her own, height-wise, with her male colleagues, Janet (Killary) Campbell shakes up stereotypes not just as a female firefighter, but as a petite one. “I’ve always been 5-foot-1 1/2,” says Campbell, a 1995 graduate, “but I may be shrinking by now.” Nineteen years of carrying 45 pounds in gear can do that to a woman. Kaylee Kolin is the rookie, fresh off her probation period on July 16 of this year. She applied in the fall of 2014, along with 4,000 applicants, prior to her graduation from George Fox in 2015. After the six-month vetting process – which included a written test, panel interview, physical agility test, and medical and background checks – she was one of 12 chosen from the first class. Then she entered her year of probation: six months in the training academy, followed by six months on a functional engine and truck crew, with exams every three months. The standards are the same for women as for men. 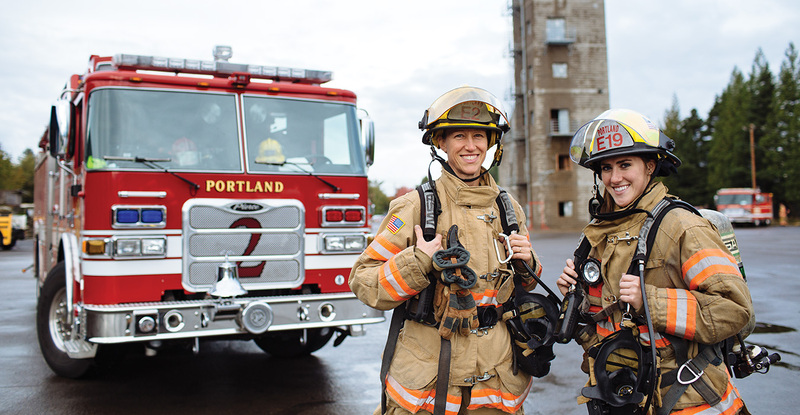 Kaylee Kolin (right) and Liz Thompson are among a small group of female firefighters who serve with Portland Fire & Rescue. 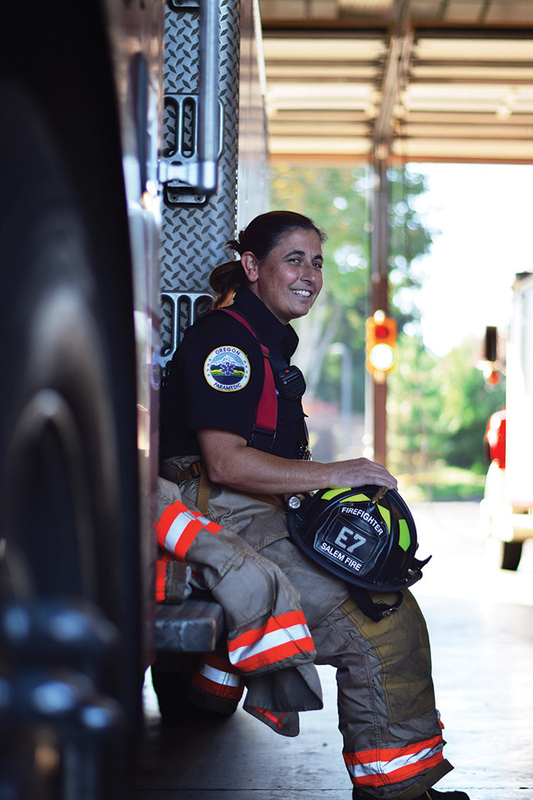 Now a full-fledged firefighter with Portland Fire & Rescue, Kolin joins Thompson as two of just 48 women out of 674 total sworn fire personnel in the city. Thompson estimates about 10 of those individuals serve in office positions, meaning the 38 remaining women are a rarity in what has traditionally been a male-dominated profession. Campbell serves in the Salem (Oregon) Fire Department. She is the only woman on her crew. 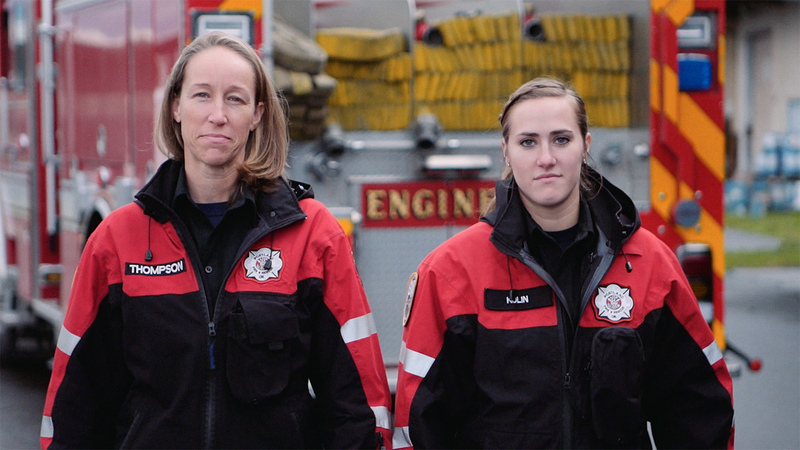 Janet Campbell is the only woman on her crew with the Salem Fire Department. But Campbell isn’t the only former college athlete in the group. Kolin helped establish the university’s lacrosse team in 2014, which, as it turned out, was good practice for her future career. The similar mentality required for both team sports and firefighting is obvious to Thompson, Kolin and Campbell. “Whether it stems from athletics or not, having a team-oriented mindset is important because it is how the fire service operates anything from small to large,” Thompson says. “In my four years, my faith grew, my heart changed,” Campbell continues. “Today, I can say that I serve an awesome God, and I am proud to have chosen a path that is honoring Christ.” None of the women thought this path would be easy. “I’ve expected it all to be difficult and challenging,” Campbell says. The sleep deprivation that comes with 24 hours on, 48 hours off, can be tough. So can dealing with people who don’t think women should be in this line of service, says Thompson, who isn’t afraid to set the record straight for anyone who thinks she isn’t capable. “As the ‘foul’ column in my basketball career shows, tact is not always my strong suit,” she says. Yet the positives far outweigh the negatives – like “having the brothers I never wanted,” Thompson says, smiling. That camaraderie and love for their job is worth a lot, as is knowing they’re forging a path for others.